The universal Innov8 electronic register immediately adds a myriad of advanced features and functions to new or used water meters without the cost or labor to change a water meter. The Innov8 universal digital register is compatible with standard displacement, multi-jet, turbine and compound water meters. Metering systems deploying the Innov8 register will restore low-flow accuracy, increase billing revenue, increase customer service features and add state-of-the-art drive-by AMR functionality. Another direct benefit of the measurement principle is the data resolution. With most odometer registers, the available data is typically only in billing units (i.e. 1000 G or 100 Ft3). 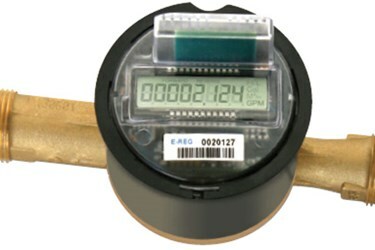 The Innov8 register records every turn of the magnet in the meter. The Innov8 electronic register can be attached to almost any common residential or commercial water meter. The Innov8 register has 512k (32,000 data points) of memory for datalogging which can be programmed for intervals between 1 minute to 1 hour (the default is 5 minutes). The data can be easily and quickly downloaded via the RF or IR channels. Data is stored accurately with an on-board real-time clock which makes the data appropriate for engineering studies for district metering and infrastructure studies.